Learn how to recognize and report child abuse. Designed for individuals and organizations that serve children and youth, providing prevention training for staff, volunteers, parents and other interested adults. Class is 1.5 hours long and utilizes video, class discussion and case studies. Certificate given to all who successfully complete the class. The realities of child abuse detailing who becomes victims, who the likely perpetrators are and the prevalence of abuse in all communities. 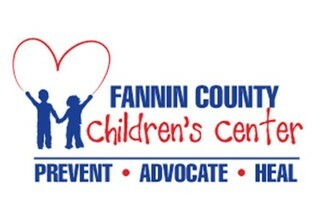 The Fannin County Children’s Center has been serving abused and neglected children since 1993. Our mission is promoting safety and improving the lives of abused and neglected children. Our programs include CASA, Children’s Advocacy Center and child abuse prevention. CASA, which stands for Court Appointed Special Advocates, recruits community volunteers to be advocates for children in foster care. The Children’s Advocacy Center facilities a multidisciplinary team of public and private agencies involved in the investigation, prosecution and treatment of child abuse. The Children’s Center is a 501(c)3 organization, therefore donations are tax deductible to the extent allowable by law. Gifts to the center will help sustain many efforts to prevent child abuse and restore the lives of children who are victims of abuse and neglect.